Is a Low Gluten Communion Wafer Really Okay for Celiacs? How Do You Celebrate Communion? Celebrate Communion Launches in December! Choosing to offer gluten free options to your congregation is a compassionate choice that we embrace and we want to help you support all those who need this option. Celebrate Communion is passionate about providing safe, gluten free Communion products. It's a simple story: See the desperate need. Match our perfect answer and meet that need. But somehow the windy road between our door and yours just wouldn't let us deliver. That is until now. We are truly celebrating at Celebrate Communion because gluten free wafers will now arrive to you in perfect condition, guaranteed. We've solved our delivery issues by stacking the wafers neatly into bundles and wrapping them for freshness. These durable bundles provide extra strength to protect the wafers during shipping. That means wafers will arrive in pristine condition every time. 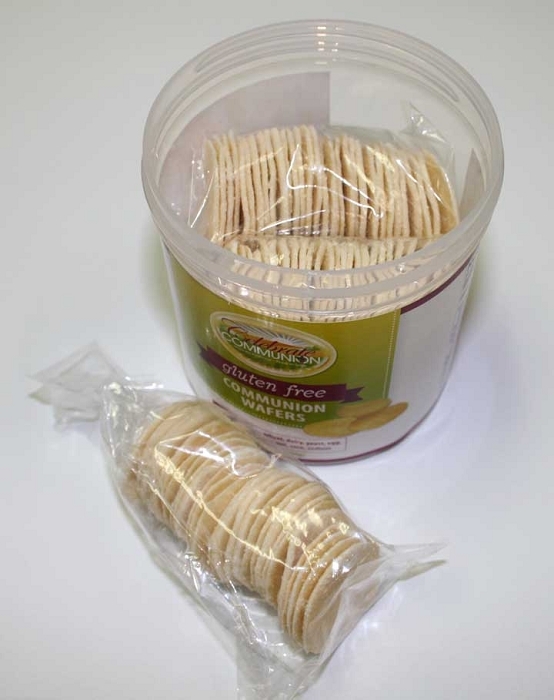 Gluten free wafers are made from a special recipe that avoids all the common food allergens. Plus they taste terrific. The popular, resealable storage container continues to provide extra safety from cross contact, giving your church members confidence they are protected. This was a long journey for us to fine tune the packaging method. We knew the resealable jar was a worthwhile storage improvement over the previous box-style and made it a bit more economical for our churches to purchase. Every time a report came in that a shipment arrived with broken wafers or crumbles, a piece of my heart broke too. For every customer that knew they could count on Celebrate Communion to immediately send a replacement, there were others out there that didn't even check in with us. Sadly, that shows up as a negative comment or online review, often anonymously with a "pen name". I wish they would have noticed the instructions on the website product page... "Due to their delicate nature some settling may occur during shipping. If there is any issue with breakage, please contact Celebrate Communion's customer satisfaction program, 877-222-0771." Celebrate Communion always stands behind our products and takes good care of our customers. My heart goes out especially to the people who need the special gluten free products. The truth is, compassion is birthed from lots of prayers, concern with finding solutions and hearing the hundreds of stories and cries for help. For me, this is personal. I don't mean it's about me, but about every person who has called or written me, anxious and desperate for support. I've learned that people have suffered quietly without hope. Their worship experience was limited when they couldn't participate with the rest of the congregation in a corporate time of Communion because it was not safe for them. With my calling in ministry as a worship leader I look for every opportunity to clear away any hindrance that keeps a person from openly meeting with God. No recipe is going to stand in the way of worship. And no broken crumbs are going to keep us from succeeding in delivering the gluten free solution. Now for other half of the story: Communion juice. We all know that grape juice is already a non-issue when it comes to serving gluten free Communion, right? Or is it? Juice itself does not contain gluten. But there's clearly more we need to know about protecting members with celiacs or gluten sensitivity. One tiny stray crumb can contaminate the juice undetected, whether that's in an individual cup, chalice or particularly intinction (dipping) bowl. Prefilled Communion juice cups are individually sealed portions. Since it's the church members themselves that open the cup, they can participate in the Communion service knowing there is no risk of exposure. What joy it must be to focus completely on the worship experience instead of possible health repercussions. Prefilled juice cups can be stored on a shelf and don't require refrigeration. Easy, simple, efficient and safe. Product description: Prefilled Communion cups without wafers (juice only). Box of 500 cups. 100% natural grape juice. Product description: Gluten Free Communion Kit contains both elements in one box. 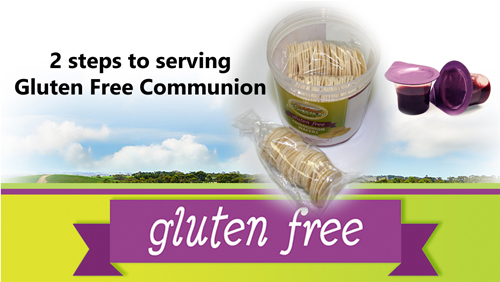 This combination has everything you need to serve a safe gluten free Communion: 30 wafers and 30 prefilled juice cups. *Also available in boxes of 60 and 350 servings and refillable travel case that holds 6 servings. Product IDs: CCC-COMGFKIT60, CCC-COMGFKIT350 and travel case CCC-TRAVEL6GF. Thanks to the insightful feedback and suggestions of our customers we were able to create better packaging for the gluten free wafers. As a direct response to your requests we launched the prefilled juice cups without wafers, exclusively from Celebrate Communion. Keep the honest feedback and ideas coming and we will continue to share it forward with others in the gluten free community. We invite you to write a product review and share your experience with others who are facing the challenge of preparing safe gluten free Communion for their congregation.